Cocoa… Mayans worshipped it. Theobroma Cacao translates as food of the gods. So farewell cucumber sandwiches, our chefs at our restaurant Rabot 1745 elevate the quintessential. Our new Afternoon Tea of the Gods, inspired by what we know best, cocoa. Summer is served at the capital’s best foodie venue. Our tranquil terrace is perched overlooking the bustle of Borough Market. Your table is waiting. As cocoa growers in Saint Lucia we exalt the bean. Cocoa is a multifaceted ingredient. From the lychee like pulp to nib infusions in 24-hour marinades. It inspires our pastry chef and chocolatier, who make fragrant bakes and chocolate creations in the kitchen downstairs. Filling to crust, everything is considered. Brioche baked on-site creates that ‘just right’ bite, the perfect hold for free range egg and chive mayonnaise with a malty edge of cocoa nibs. Or try a rare cut above. Grass-fed Hereford beef 24-hour marinated with treacle and parkin spices. Fiery wasabi horseradish is tempered in our high-cocoa butter white chocolate. Pea, tarragon and chickpea mousse made with delicate cocoa pulp and fresh lemon juice. Thinly sliced radish and pea shoots do it poetic justice. Rye sourdough is from our local bakery, Borough Market. Vegan afternoon tea? Just let us know ahead at time of booking. Yes there’s clotted cream. Yes there’s strawberry jam. But how many cream teas are accompanied with their own 70% dark chocolate ganache made on-site? Now that heightens the ‘which first’ cream tea debate. Does cream, jam or high-cocoa ganache take priority on your fresh baked cinnamon or sultana scone? Forget tradition. Cheesecake reimagined as a light, airy mousse made with fragrant Madagascan vanilla and all-natural strawberry gel purée. Cocoa nib crunch in the biscuit base. Opulent layers of light chocolate mousse, cherry purée and Madagascan vanilla sponge. Topped with a kirsch soaked cherry and 70% dark ganache. Finally… tasting chocolates, many made with cocoa grown on our Saint Lucian Rabot estate. And then there’s tea. All the classics are here – English Breakfast, Earl Grey – but there’s so much more. We believe our four bean Arabica blend is the best coffee on the high street. 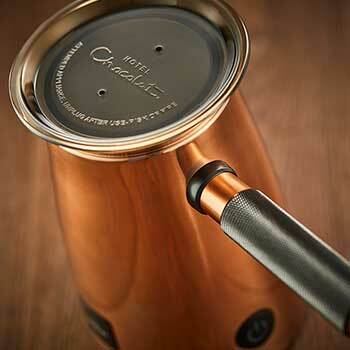 Or try our signature Hot Chocolat, made with no syrups, powders, or artificial anything. The best place to enjoy Chilled Chocolat made with our cocoa nib-infused Ice Cream of the Gods? A sunny day on our terrace. Heaven. Which suits your taste? We have seven options whisked to perfection with oat milk, from a 70% dark starting point up to 100%, or try hazelnut, mint or chilli (fiery, just how the Mayans made it). Our grocery? Our neighbours, Borough Market. Free range: we insist on it, from egg to chicken. Pastry chef: Fabrice, will taste test to perfection. Join us at Rabot 1745. Afternoon tea for two £30 each, add a glass of our chilled Prosecco for £5. Vegan, gluten-free, special dietary requirements? Simply let us know at time of booking.